You fail sometimes … when you spend much of your eight years in office chasing photo ops around the world and doing whatever it takes to get your face in front of TV cameras, campaigning for your political future instead of governing your city. You fail sometimes … when your smiling portrait greets travelers at LAX, presiding over domestic terminals whose shabbiness and disarray comprise the first impression thousands of tourists have of the city. You fail sometimes … when you accept tens of thousands of dollars in free tickets, food, and drink from arena owners doing business with the city without disclosing them as gifts, then claim you attended such events as a Spice Girls concert and an American Idol finale on official city business, then are forced to pay the highest-ever fine under the state ethics law. You fail sometimes … when Charlie Sheen tweets a photo of you and himself at a hotel opening in Cabo San Lucas just as your name is being bandied about as possible U.S. Secretary of Transportation. You fail sometimes … when you explain to the media that you hung out with Sheen for three minutes, and Sheen tells his followers you partied hard with him for two hours, and somehow Sheen’s explanation carries more credibility. You fail sometimes … when you announce you have withdrawn your name for consideration as Secretary of Transportation, sparing the No Drama-Obama administration any future such embarrassments. You fail sometimes … when the greatest risks you take in office stem not from political courage, but from an inability—personally and politically—to curb a crying need for instant gratification. 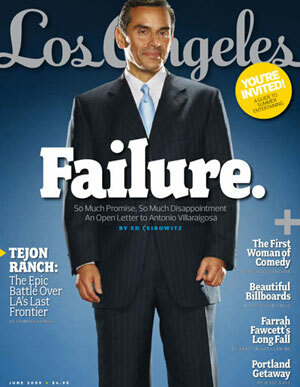 You fail sometimes … when you come into office with a unique capability to span the city’s divides, connecting Angelenos in Boyle Heights with those in Bel-Air, and leave office with the chasms between the city’s richest and poorest neighborhoods wider than they’ve ever been. We didn’t see swinging for the fences in his first term, or his second. Instead, we watched the spectacle of our mayor repeatedly shooting himself in the foot. 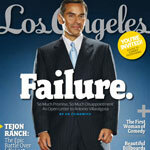 Half the populace did, however, dare to dream when they voted for Villaraigosa. Hopefully L.A.’s next mayor will have more respect for those dreams.